James McClintock and Baxter Watson were in the steam gauge manufacturing business in New Orleans and locally noted for their talent in engineering and design. By late fall of 1861, these two inventors began the construction of a three-man underwater boat. During the early phases of construction another Louisiana gentleman eagerly joined McClintock and Watson in their underwater venture. His name was Horace L. Hunley. Hunley was born in 1823 in Sumner, Tennessee. He would eventually walk many paths in his life: Deputy Collector of Customs in New Orleans, State Legislator for the state of Louisiana, lawyer, merchant, a successful Southern planter and most notably, submarine innovator and financier. Hunley recognized the importance of breaking the Union blockade and keeping supply lines open to the South. The small band of Confederates began work on a new approach to naval warfare, one that took the fight below the water’s surface. This quest became a process of innovation and evolution. Working with Hunley and Watson, McClintock developed two prototype submarines, the Pioneer and the American Diver. Improving the concept each time, they finally had success with the creation of the Hunley, a weapon that would forever change naval warfare. The Pioneer was built in New Orleans in early 1862 and performed moderately well. The small submarine would sometimes become caught at the bottom of Lake Pontchartrain with the crew cranking the propeller, unaware they were stuck. After only a short month of tests, the Pioneer was destroyed by the Confederates to avoid capture by the Union army that was quickly closing in on the city. Union occupation forces were entering New Orleans when the three inventors, carrying blueprints, diagrams and drawings, fled to Mobile, Alabama, with the intent of designing an even more formidable submersible attack boat. During this timeframe, the group began to receive local military support. 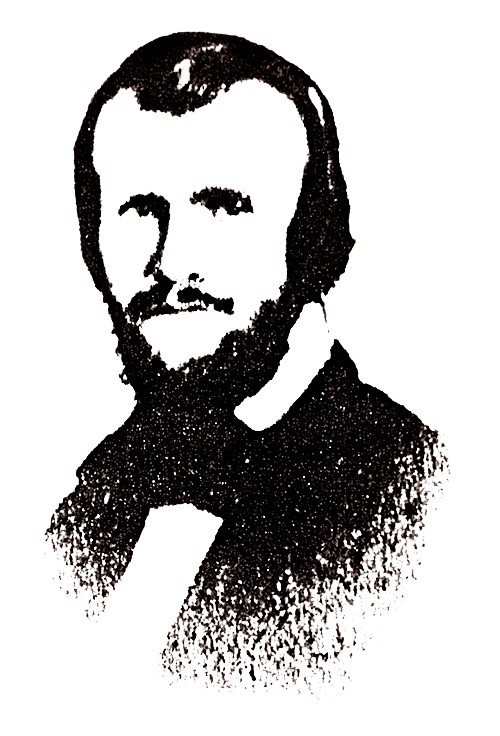 Lieutenant William Alexander, CSA, of the Twenty-First Alabama Volunteer Regiment, was assigned to duty at Park & Lyons. The group of engineers made several attempts at propelling the new sub with an electric-magnetic engine or a small steam engine. Unfortunately, they were unable to produce enough power to safely and efficiently propel the submarine. This “trial and error” process took place over a period of several months until they decided to stick with a more conventional means of propulsion. They installed a hand crank and, by mid-January 1863, the American Diver was ready for harbor trials. The American Diver, according to McClintock, was “unable to get a speed sufficient to make the boat of service against the vessels blockading the port.” Despite the American Diver’s apparent limitations, evidence exists that indicates she left from Fort Morgan sometime in mid-February and attempted an attack on the blockade. The attack was unsuccessful. Soon after, another attack was planned, but as she was being towed off Fort Morgan at the mouth of Mobile Bay in February of 1863, a stormy sea engulfed the American Diver. Fortunately, no lives were lost. The American Diver was never recovered, and her rusting hull may still remain beneath the shifting sands off the Alabama coastline. Her exact location was long ago lost by history. 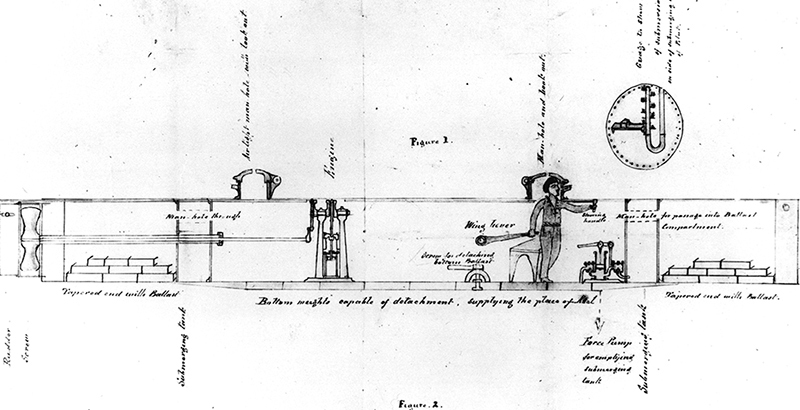 Blueprint of the American Diver, an improved concept developed by McClintock.